up about walking up hills in races, try re-scripting: “walking” becomes “powerhiking.” OK, now that sounds better! Powerhiking up hills, especially ones that are steep and/or later in a race, is often more efficient (requires less effort and a lower heart rate at the same pace) and effective (faster movement at the same heart rate) than running. The best mountain runners use a range of techniques and cadences throughout the course of a race. When powerhiking without poles, you can swing your arms in unison with your steps. Or (especially on steeps) put your hands on your quads and push down on each step; this can create a fast and powerful motion when combined with longer strides. Bending over to push on the quads with the hands can stress the back and should therefore be practiced extensively before using for hours in a race. Stride length and cadence can be varied as well; compare short, fast steps to long, slower ones. 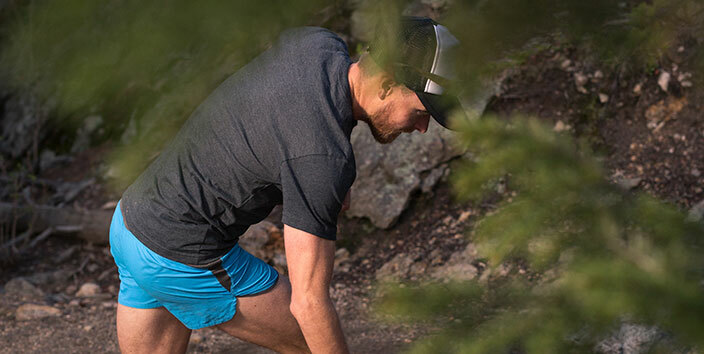 Whether you’re running or powerhiking or both, altering technique from time to time in long races may be helpful. Some running purists eschew the European geeksticks, but I find them to be extremely helpful for ascending and descending steep terrain. Poles provide a boost and transfer of power when climbing and ease the pounding when descending. I choose one of three poling techniques depending on terrain, speed and which body parts need a rest. What’s probably the most common technique involves poling in unison with footsteps such that the right pole plants and pushes with the left foot and vice versa. On the really steep stuff, I use both poles at once by planting them way up ahead (hands well above head level upon planting) and then pulling the body through and past the plant-point before extending the arms backwards to push with the triceps, with many steps occurring between each planting of the poles. In a variation of #2 that may work well when running uphill or down, mimic the poling of skateskiing, wherein one pole lands and pushes off just a split second before the other. On your next hilly long run, test a bit of powerhiking after your legs have taken on some fatigue. If you like to “go by feel,” then simply scroll through the techniques above, feeling out which one(s) are the most effective for you. If you’re more scientific, then ascend the same climb (ideally one that mimics the grade, footing and altitude of your upcoming race) numerous times at the same heart rate, varying the powerhiking technique on each ascent. Record the times and see which ones are fastest for you. Be sure to include running as well. For a test like this, you might limit the climbing segment to 10 minutes or so to cut down on cumulative fatigue from additional ascents. To really geek out, repeat the test on a range of grades to determine which running or powerhiking option should be used when. You may well not have access to steep trails for training even though your out-of-state race will be full of them. In this case, move to the mountains. But if that’s not feasible consider using a treadmill, stair climber or stairs to practice your powerhiking techniques. Though potentially awkward and uncomfortable, stairwells in tall buildings may be the best option because they allow for exploring short strides (hit every stair) vs. long strides (every second or third stair) and force the athlete to prepare for descents by running or walking back down the stairs. Stairwells may be boring, but they’re also good mental training. As you crush it this summer in hilly ultras, remember that running the whole way may not be in your best interest. And just like you will practice your nutrition, pacing and gear choices, be sure to intentionally work on your walking – I mean powerhiking! Nice info. Though I am still a plain terrain runner, would take up hill trails soon. I too used to think, till I read this write up, that walking during a Run is a no no. Thanks for correcting me. I have a query : are short walking breaks ok during city marathons? Why not? Walk when you need to…allows you to remain aerobic and rest your muscles temporarily. Have done it multiple times. Only issue is you need to stick to your guns and not feel intimidated that you are walking, since I’ve seldom seen walkers in a road race…IMHO, run trail races, way better fellow runners! I completed my first Mount Washington Road Race last month. I had concerns about how much I would need to walk and had worked out a strategy that had worked for shorter training runs-walk so many steps and power hike so many- which kept my momentum going and my fatigue level in check. Though I ended up power hiking about 2/3 of the race I still finished in my goal time and passed many very fatigued runners who had tried to run as much as possible. The key is to “make it count” when you walk. You can maintain a good pace that is often faster and more efficient than trying to run.